Schematic diagram of hydraulic fracturing in tight gas sandstone. There has been a lot of talk and media coverage about the recent frenzy of drilling activity in eastern Utah’s Uinta Basin, and you may be wondering what all the hubbub is about. It has been a very exciting couple of years for oil and gas exploration companies with interests in the Uinta Basin, mainly due to large and profitable reserves of natural gas in deep reservoirs (rocks capable of storing oil and gas). Oil and gas prices have been increasing over the past few years, and this increase has spurred a drilling boom in Utah and other western states. Utah is the 10th largest producer of natural gas in the United States, with most of the production coming from the Uinta Basin. The Utah Division of Oil, Gas and Mining recently reported that more than 19 billion cubic feet (Bcf) of gas was produced from the Uinta Basin during November 2006. Most of that gas (14.1 Bcf) was produced from the Natural Buttes field, the largest natural gas field in Utah. This field is located in the eastern part of the basin and has produced an impressive total of 1.3 trillion cubic feet (Tcf) of gas since production began in the 1950s. Production of natural gas from this field, and most other gas fields in the Uinta Basin, largely comes from tight gas sandstone reservoirs of the Upper Cretaceous (83 to 71 million years ago) Mesaverde Group and the Paleocene-Eocene (57 to 49 million years ago) Wasatch Formation. The U.S. Geological Survey estimates that the tight gas sandstone reservoirs of the deeper Mesaverde Group alone have 7.4 Tcf of undiscovered, technically recoverable gas. The potential for future exploration, drilling, and production in the Uinta Basin certainly looks bright! What is a tight gas reservoir? Tight gas reservoirs are often called unconventional reservoirs because “tight” refers to the fact that the permeability of the reservoir rock is very low. Permeability is a measure of the connectivity of pores, which are the spaces between individual grains, in sandstone or other rock types. The more connected the pores, the higher the permeability and the easier it is for liquid or gas to flow through a rock (for example, to a well). Unlike conventional reservoirs, unconventional reservoirs cannot produce economic volumes of gas without first being stimulated by using special processes such as hydraulic fracturing. Tight gas reservoirs include sandstones, carbonates (such as limestone), shales, and coal beds. Almost all of the natural gas currently produced from the Uinta Basin comes from unconventional reservoirs, especially tight gas sandstones. Because tight gas reservoirs are nearly impermeable, artificial fractures, or hydraulic fractures, need to be created before the gas will flow at economic rates. The fractures are formed when a liquid is pumped down the well at very high pressure. This highpressure liquid, made up of water and a more viscous (thicker) liquid, exceeds the strength of the rock and opens a fracture. To keep the fractures open after the pumping pressure is released, a propping agent such as sand is usually added and carried into the fractures by the fluid. 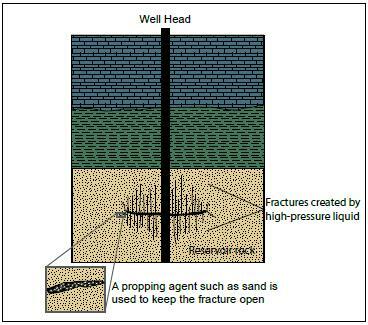 Hydraulic fracturing connects many pre-existing fractures and flow pathways in the reservoir rock with a larger fracture. This fracture system starts at the well and extends out into the reservoir rock as much as several hundred feet. Deep wells may have as many as 20 separate hydraulic fracture zones. Enhancing the fracture system in the reservoir increases the permeability, or the number of pathways, through which gas can flow to reach a well. In the early 1970s, exploration pointed to the presence of gas locked inside tight gas reservoirs in the Uinta Basin. However, the cost to produce or “unlock” the gas was vastly greater than the revenue of selling the gas on the open market. Conventional reservoirs were far more economic to produce. 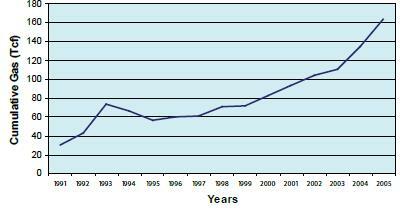 But in recent years, increased consumer demand has caused an increase in gas prices. That, along with new exploration and production technologies and a decline in production from conventional reservoirs, has increased exploration and production of natural gas from unconventional sources such as tight gas sandstones. The number of permits to drill exploration and production wells in the basin has steadily increased over the past decade and will likely continue to rise. The Uinta Basin has produced a total of 2.6 Tcf of natural gas. According to the U.S. Geological Survey, the basin still has a reserve of over 16 Tcf of undiscovered, technically recoverable resources. As gas prices continue to rise and advances in technology continue, exploration will continue to grow and move from shallow conventional reservoirs to deeper, unconventional reservoirs like those found in the Uinta Basin. Natural gas exploration will likely continue to “barrel” forward by hundreds of wells in the coming years, and the Uinta Basin will likely become an even bigger player in contributing to national natural gas production.